Most people, of course, don’t use URLs this way. This isn’t because they are more or less error-prone in their typing, but rather because their primary experience of web navigation is different – search engines are the front door to the web to many; they are the web to even more. This even holds true for when users do know the URL – we’ve all watched, head in hands, people type fully-qualified URLs into Google. Organisations have caught on to this, and it interests me that we are witnessing a shift in how they direct you to their online presence from offline sources – adverts, brochures etc. It seems especially prevalent in government ads – the Royal Navy’s current TV advertising campaign, for example, simply tells the viewer to “search for ‘navy jobs'” for further details. The assumption, of course, is that they will rank #1 in whatever search engine the user choices. The risk, of course, is that somebody finds a way to hijack the listings for this term. It’s an old joke, but anyone who’s ever searched for ‘french military victories‘ knows what I’m talking about. Even ensuring you’ve got the top PPC hit won’t compensate for that level of negative PR. What’s interesting is that, for the sake of usability, organisations are choosing to add an additional stage to the process of finding their website. By directing people to search for a term and then click on the result, they’re actually lengthening the process in order to make it easier. Risk factors aside, it’s a pretty good idea, and a pretty major development. What Does The Future Hold For URLs? So is natural language taking over, and are all attempts to improve URLs futile? Has the slow progress of the regulating bodies meant that we’ve had to find a better solution? Of course, some URLs are clever slogans themselves and add value to a product, but it seems that most are arbitrary identifiers, obfuscated by acronyms, abbreviations and dots, dashes and other de-humanised elements. What do you reckon? Are the unbelievable sums of money spent on domain names wasted? Should Google Search stop using the URL of a site as an indicator of relevance? 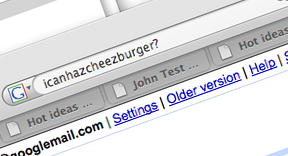 Or will their omnibar, or Mozilla’s ubiquity, be the final nail in URL coffin? At least we don’t have to type in I.P addresses. Not a bad article over all, but several grammatical errors kinda erked me. I only use the address bar too, I love Firefox’s ‘awesome bar’ and search keywords; both reduce the chance of me making typos without clogging up my browser window. See http://kindurl.com/ — a coworker of mine set it up and it seems to do a pretty good job. It makes a more human-readable url. @Nes – quite. I just wish that more of our internal hardware had hostnames as well! @Dazed – Good spot on those. I have corrected, and made a couple more changes for readability. Thank God for in-browser spell check helping us out, at least! @Peter – Address bar is for winners. Those aren’t “friendly URLs”, as indicated in your post title. You’re talking about domain names. >several grammatical errors kinda erked me. hmm. pot calls the kettle. As you mentioned, I think that Google’s Chrome has already begun the path of conversion to natural language by merging the ‘search bar’ and the ‘address bar.’ As search results get smarter, people will less and less use exact URLs, and instead just type in keywords for the content they want to see. Here’s my two-pence worth… I personally use the FireFox address bar and bookmarks more than any other navigation aid, although my job means I can’t completely lose track of URLs, and even direct IP addresses to some degree. I used to use Launchy, but the FireFox 3 made this pretty redundant. I’ve started to use Ubiquity more and more, especially with the MAP command. However, it just isn’t reliable enough on its EMAIL command, which is a shame because it promises so much. I’ve noticed too that browser address bars now seem to cater for many different navigational personalities; Google Chrome is pretty darn good too in this way. I actually saw this mostly with old people. The younger people learn about 10000x faster and rarely do this. And I believe if you give the old people more time, sooner or later they will discover their ways too. Great article, Sam. Urls are becoming part of the language of the web (and popular culture). I think they’re here to stay.